We were proud to present the 2017 Deborah P. Altman Outstanding Volunteer Youth Awards at the Junior League of Lancaster’s May General Membership Meeting. 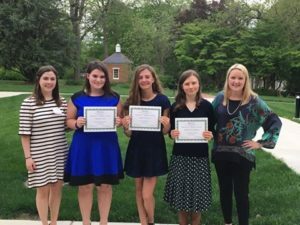 Congratulations to (left to right) Megan Polites from Elizabethtown Area School District, Regan Donecker from Pequea Valley High School, and Madeleine Meldrum from Hempfield High School! We are proud of each of you and inspired by your volunteer efforts! We hope you continue to serve the community and perhaps join the JLL someday.